Showing results for tags '=ADK='. Hello All, My IGN is Shifty, real name is Tayler. I have been playing DayZ Epoch on the =ADK= Server for a while now and have loved all the ups and downs of it so far. The Staff has been helpful and has done nothing but further my experiences on their server. As for me, i am a 22 year old Male who enjoys first person shooters, MMO's, and Sandbox Shooters. Im currently serving my 5th going on 6th active duty year in the US Army. I joined at 17 and spent my 18th birthday in Afghanistan. Upon Leaving Basic i completed Airborne School and RIP (RASP) as it is now called, from there i was stationed with 3/75 Rangers HHC Scouts. i deployed 3 times on 110 day power deployments with them and received my CIB and a Bronze Star w/ V indicator. On my second tour with them i was shot 2 times in my upper back and once on my left side (fully healed) and recieved a Purple Heart w/ V indicator. On return i recovered and went through sniper school, SEERs 1,2,3 and stalker school. i also have Gryphon group and language school under my belt. Going on my 3rd year i Decided i wanted to further my career so i opted to go to SFQC, after 2 years of the q course i graduated as a 18B weapons SGT where i was stationed with 3rd SFG at Ft Bragg NC where i currently reside. I have deployed twice with 3rd SFG and am currently recovering from injuries on my last deployment so i have alot of free time on my hands when I'm not at work or doing physical therapy. I'm a little hard of hearing from gun shots, explosions and being in helicopters most of my army career. I'm also legally blind in my left eye and in a wheel chair or using a cane to get around. I have a Beautiful wife who also plays the mod as well as Standalone, but she mostly streams WoW. I think that about sums it up about who i am and what I'm about. Hope to see you guys around. Feel free to hit me up in game anytime or in the ADK TS. Thank you for your time, Shifty Tayler. 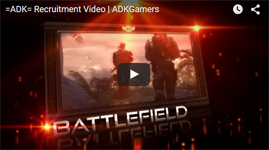 BF4 ADK servers going down? What's gonna happen if all the ADK servers in BF4 go down? Wed obviously keep the platoon but would we have any regular servers to play on? It seems like something that no one ever mentions, but we need a plan to keep the platoon together if/when the servers come down. [COMING SOON] Weekly Blog - Ask questions! As you all know the members of the =ADK= Scrim Team - pA will be posting a weekly blog or 2 for all of you to read and find out some tips and tricks. We're opening up this blog to any questions that you all might have. They might not always answer all questions in each blog, but they will try their best to get in as much information as possible for all of you. You can follow this blog to stay up-to-date by clicking "Follow This Blog" on the right hand side of your screen. If you do have any questions that you'd like to see answered, leave them as comments in this blog. At the current time please make all questions related to gaming. All questions not related will not be answered. Ask away!